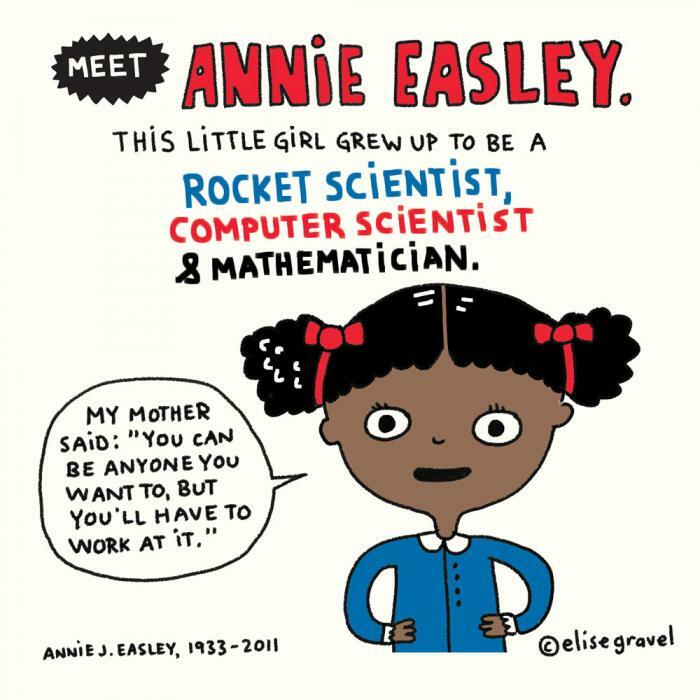 I made these illustrations of little girls who grew up to change the history of science and technology. Teachers and parents, feel free to use these to show your kids great role models. I will add more. You can also find the series on Facebook HERE. Your suggestions are welcome! Doodle + creative tip of the day: if drawing something in particular makes you feel good, draw it as often as you want. Don’t feel guilty about being repetitive. It doesn’t mean you’re not creative. Drawing can be a form of meditation, and meditation is often repetitive. 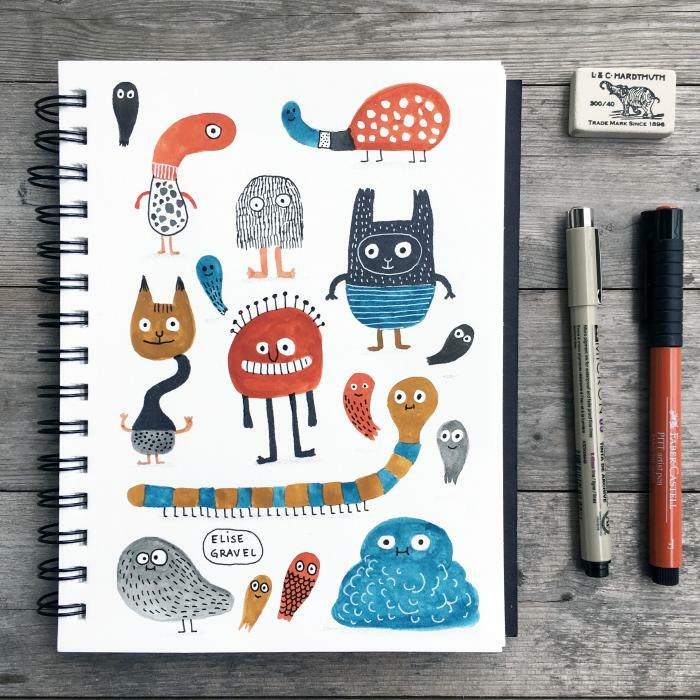 Drawing can also be about having fun, and drawing what makes you feel good is a way to reconnect with the simple childish pleasure of making things appear on paper. In my case, I feel good drawing weird creatures, birds, and cacti these days. What’s your special feel-good subject? For more creativity tips, follow me on Instagram. 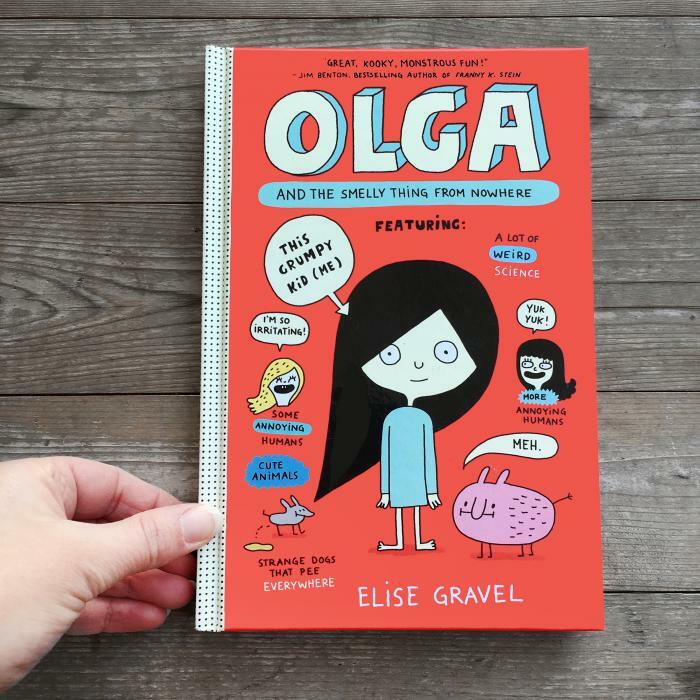 I’m giving away 3 Olga books on my Instagram account! It’s this way. My new books is in stores today! What you’ll find in it: a grumpy scientist, some annoying humans, a dog that pees everywhere, tons of cute animals, gross science facts, mac n’ cheese, a boy with hand-drawn hair, a lesson on poopology, and a very special and smelly creature that will melt your heart (I hope). Available online and in bookstores! Drawing live on The New York Times Books! I had the great honor of being invited to draw and chat live on The New York Times Books‘ Facebook page! That’s why, if you watch the whole video, you’ll have the privilege of seeing me make a mistake while hand-writing the title of one of my books. C’est la vie! Also, the interviewer mistakenly said I had translated the book myself. I didn’t; Richard Kutner did this excellent job. I’m sorry I didn’t correct her at the time, I was very nervous. To buy the book The Great Antonio, click here. Meet The Great Antonio! My latest book tells the story of Montreal strongman Antonio Barichievitch, a colorful giant who pulled buses and trains with his hair. Yes, for real! I can’t wait to hear what your kids think of him. You can buy my book in every U.S or Canada bookstore, or online everywhere. Teachers and parents: you have my authorisation to print this image (in full-color or black-and-white) as a poster for your classroom, your kid’s bedroom, your office, your t-shirt or wherever you want, for free. Please don’t sell it or use it on products intended for sale. The high-res image is available here. 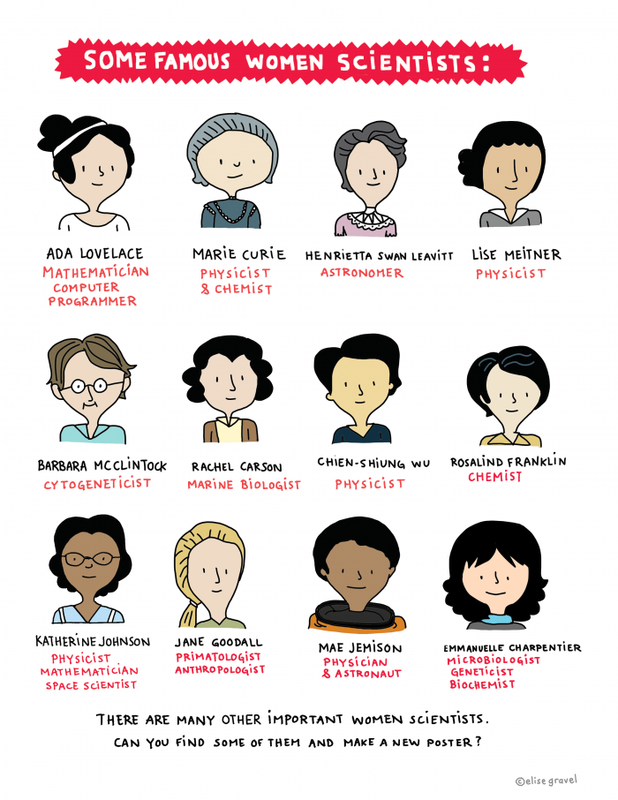 I am aware that many important scientists are missing from this illustration. The selection process was hard! Please feel free to suggest your favorite famous scientists in the comments below. You can even create your own poster. This one is far from complete; just my little personal attempt at inspiring young girls to study science. Here’s my latest book! Ada hates everything about ballet class, yet she still has to go! Arabesques? Grotesque! And then one Saturday, Ada pliés right out the door and into the hallway, smacking into someone who thinks her ungraceful moves are great! Based on a true story (OK, MINE), Ada will demonstrate that being angry is OK, that being bad at something doesn’t mean you’re bad at everything, and that you have to experiment to find your way. Hope you’ll like it! The toad is in stores now! The Toad, latest addition to my Disgusting Critters series, is in stores now! Long live The Toad. You can buy it here or at your favorite local bookstore. Teachers: find a fun activity book on The Toad here! I am delighted with this review from my latest book, The Cranky Ballerina, from The quill and Quire. They compare me to Kate Beaton, Jon Klassen and Melanie Watt!! I think I’m going to explode with pride. 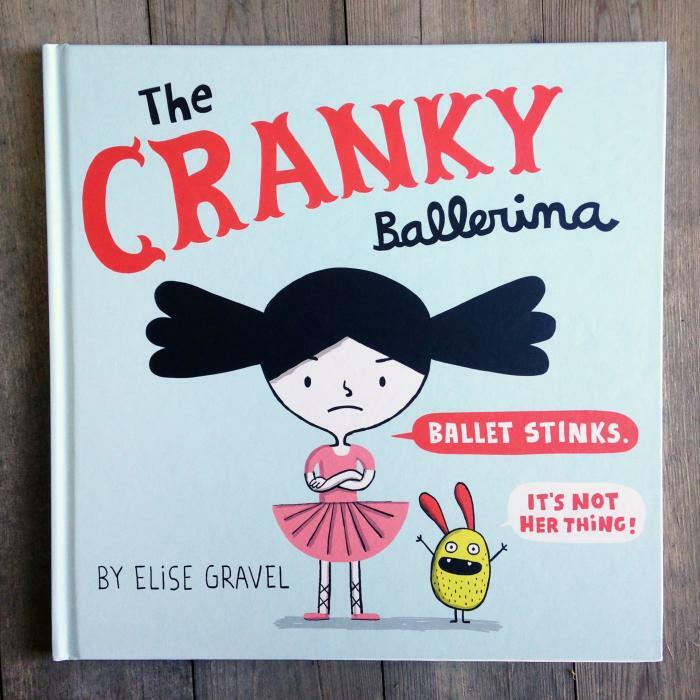 The Cranky Ballerina introduces readers to Ada, who, as the title suggests, is a reluctant dancer. Ada’s not usually in a bad mood, except on Saturdays, when she has to go to ballet class. Happily, Ada discovers that although her moves aren’t ideal for ballet, they’re perfect for karate. She joins a karate class, and suddenly Saturday mornings are fun again. 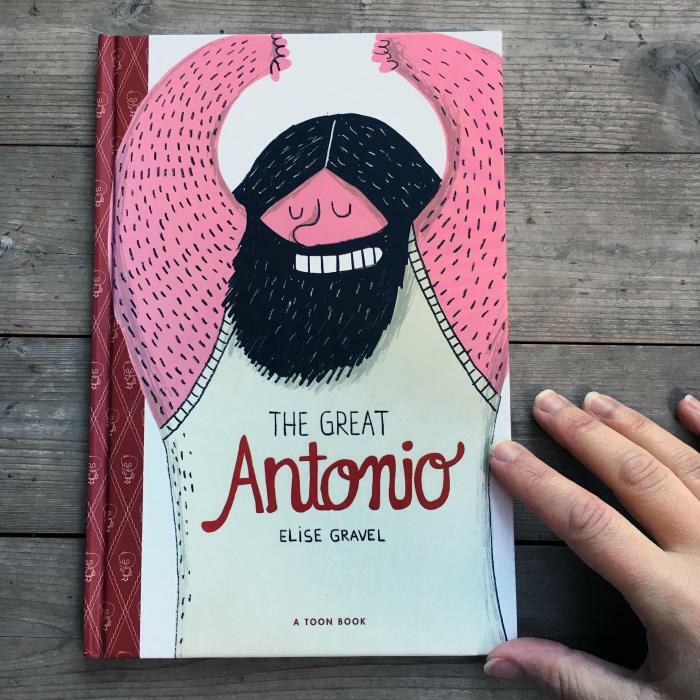 The latest picture book from Montreal author-illustrator Elise Gravel includes everything fans of her work have come to expect – fun, expressive illustrations; witty text; and a unique but relatable perspective. The story finds a creative way to teach young readers a valuable life lesson: they don’t have to be good at everything they try. By following Ada’s story, they’ll also learn that sometimes failing at one thing just means they might end up being exceptionally good at something they haven’t tried yet. The book also looks at the ideas of community and kindness. While Ada’s ballet teacher tries hard to encourage her, her fellow students aren’t as kind. But when she joins the karate class, Ada finds a place where she really fits in, and people who support her and cheer her on. Parents and teachers will have no problem finding funny details in the illustrations, and the speech bubbles will make it easy to get creative when reading aloud. Fans of Kate Beaton’s The Princess and the Pony, Jon Klassen’s This Is Not My Hat, and Mélanie Watt’s Scaredy Squirrel series will love this one.